Paint Water in the Ocean : Painting Techniques| Oil Paintings :: How to Paint Realistic and more! When I first turned my attention to painting the water in the ocean and its surroundings, I came face to face with the exasperating and ridiculous task of trying to make it stand still long enough for me to study and paint. I soon learned that the very thing that had brought me to the ocean as a subject was the quality I was trying to take away from it. I came to realize it was not just the ocean that had movement-tides, currents, changing surface –but so did the sky and the sun. Our source of light, the great zenith of the sky, the clouds ever changing, all reveal to the artist reflection and reflected light, with the atmosphere breaking up the light and allowing us to observe and live with the colors on nature’s palette. Even the stately rocks had their days of movement when the Ice Age pushed, shoved, and arranged them in the beautiful patterns and shapes that we see today, the ocean constantly gnawing at their polished surfaces, breaking and chipping, creating new forms to delight the eye. 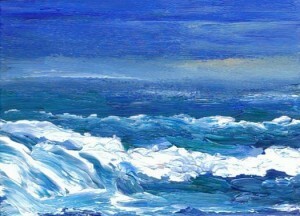 To the person who wants to paint the ocean, I say: go to the ocean and live with all its moods and movement-become, as much as you can, part of it- give yourself a chance to acquire more understanding and respect for the subject that you have chosen to paint. There are many today who use books, paintings, prints and photographs to work from. I grant that they have some merit. By studying them some useful information may be gained-eve something that is bad may point a good direction. But the great lesson is in experiencing the moods of nature, the moods you wish to paint. To paint only the surface of the subject, and the surface may be only paint-skin deep. The true beauty of art lies beyond this point. It lies within the realm of feeling. In order to feel the ocean, one must go to the ocean. Winslow Homer’s paintings are great, not because of their surface, but because of the depth of emotional knowledge he gathered from his association with his subject. When viewing one of Homer’s paintings, you do not at first sense his paint quality, but you feel a great emotion that comes only from the elements-the ocean, the sky, the wind, and life itself. It goes without saying that the canvases of Homer show great technical skill. An artist’s search for more understanding of his medium and its application never ends. As your knowledge increases, you will be free more and more to express your thoughts. As for the technical side of painting, leave no stone unturned to increase your understanding of the artist’s materials and their use. You should have a good sound working knowledge of color, linear perspective, aerial perspective, light and its effects, composition, values and what constitutes a good working palette. In this regard, a number of books on the market today will help. From these technical books, you may find he different materials best suited for your own particular needs. There may be some of you who read this book who only go down to the ocean on occasion to paint. Your first love in painting may lie in another part of nature. Let me assure you that the study of one phase of nature is the same as any other phase. In an obscure back yard, a seed is planted, watered, miraculously springs to life with movement and growth, produces flowers that possess color and scent, then returns new seeds to the earth to repeat he whole beautiful cycle again and again. This is the same explosive sequence you see as great waves crest and rush over rocks to return to the ocean. It is sometimes a great comfort to know that your fellow artist painting a different subject has the same unending search into nature as you have. It is only his interpretation that differs, along with his manner or style. It would be best if I did not have to say a word about style. There seems to be a great seeking on the part of some students for a style. This is too bad, for there is little enough time to paint without wasting it on something hat exists from the very beginning, something that will develop naturally as you become more proficient. Your style is as your handwriting, a part of you. What you are is what your style will be. To the beginner, one of the most frustrating studies to cope with is the movement of the ocean and foam breaking in and around the rocks. At times what is happening can be seen very clearly and is very obvious. Other times, it seems like utter confusion and chaos. So many factors come into play that some form of organization must be evolved to help study this seemingly erratic behavior. If you are making your studies of wave movements at high tide and some of the action is unexplainable, be sure to return to the same spot at halftide, then again at low tide. Some of the action may be due to the formation of the ledges and the rocks beneath the surface. ocean can ricochet from one unseen surface of a ledge of rocks to another, creating turbulence that seems unexplainable. Another great factor is the tide and its movements. At high and low tide, there is a period of calm where there is no movement at all. The ocean may roll in a classic form allowing a clear insight into its formations. The action of the ebbing tide, running in one direction, is totally different to its counterpart approximately six hours later running in the opposite direction. When the strong tide begins its movement, it sets the great undertows in motion, pulling the ocean sideways, kicking large sections of foam skyward, first one way then the other. If the artist is conscious of what is going on, then all of this becomes organized and is readable. If the ocean are caused by a fast-moving line storm in which the winds reach a high velocity in a very short span of time, the waves are choppy and high with very short spans or valleys between them, sometimes breaking as far as the horizon in short, choppy little mountains. These treacherous storms are hard to study for the breaking of the waves lasts for but a moment, not allowing any sustained study period. Storms which last for only a short time may end with the wind shifting in the opposite direction, knocking the choppy ocean down as fast as they made up. To the fisherman and his mall craft, these squalls are unpredictable and extremely dangerous. Large storms that occur with winds reaching gale force for a period of three or four days are storms of huge ocean with long troughs between them. These ocean allow the observer to study them as they slowly build, crest and hold for a moment, then peel off, rushing their mountains of foam in and over the land. Then, as this water turns and rushes seaward again, creating an enormous undertow, it sometimes kicks the next wave right out from under itself. Only a large headland seems to influence these movements; the smaller rocks are just inundated. But as the torrents of water recede, smaller surfaces play a great part in creating patterns-the heavy foam pours off and around them, creating beautiful shapes of light against dark rocks. As the incoming ocean crest, large amounts of foam are caught up by the fierce wind, and driven ahead of the wave action, soaking everything in its path. The opposite is true as the storm breaks and the wind shifts. The spume is then driven back over the waves, creating a beautiful misty veil which is sent skyward and back-a waterfall in reverse. There is a wave action that you may witness on occasion which is a delight to behold. The great ocean seem to come from nowhere. These are the great ocean swells that are created by some unseen storm. They literally develop from nothing, slowly becoming moving mountains in slow motion. These swells are known to have traveled for hundreds of miles. They create the classic wave type in action and, when breaking, allow for long periods of observation and study. They may arrive at your shoreline on the most beautiful of days. This is the only type of huge wave action that one can study in complete comfort. In some sections of the world, this is a common occurrence. These are places that have strong tradewinds that keep the ocean in constant movement in one direction. I would like you to consider for a moment the actual movement of waves. At first glance, you would think that the water is actually in a forward movement. If this were true, then in a storm of great magnitude, all of the water would be on one side of the ocean. Rather, the movement of the ocean is up and down, not forward. To demonstrate this action, take a long clothesline and tie the far end down. Now, with a flip of the wrist at the free end, give the line a quick up-and-down motion. Watch the action move down the line to the far end, like waves. Because the far end is tied down, it can have no forward movement, but the line undulates in a pulsating rhythm, the same basic principle as the waves. Another thought. To me, the life that accompanies marine painting is a life of freedom, not particularly physical freedom but freedom of thought. It is almost impossible, as you walk the beach or sit high above the surf on a rugged cliff, to do anything but organized thinking. You may have random or even subconscious thoughts, but this thinking always lends itself to a betterment of your understanding, no matter how small. You can free yourself from man-made laws at these moments spent by the ocean, realizing that it is the natural laws of nature that govern our very existence. If you look to natural law as your teacher, you will more readily understand the cresting of the great ocean which have been spawned in the bowels of some unseen storm hundreds of miles across the curve of the horizon, as they make their way to the rocks below, ending their long voyage in a burst of spume for your contemplation. If, on this day, you but sense the vastness of your subject, your effort will not be in vain and your painting cannot help but improve. These are the blocks on which you build your painting, not on the fact that purple is the recognized color scheme this year, or thick paint on the canvas is more popular than thin. If you succumb to the latter, you are destined to change your thinking and painting each year as the trends drift from fad to fad.